The Maya playhouse is a charming and good sized playhouse that is sure to give the kids in your life a fun little space of their own. 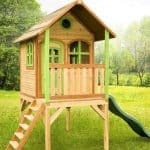 They will get many, many years of fun out of this playhouse and due to its pressure treated design, you do not have to worry about treating the wood or any issues with rot. 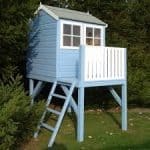 This adorable playhouse has a lovely little decking area that they can get to via the small step. A high apex, saddle style roof just finishes the playhouse off perfectly and it is going to be something that looks very good in your garden as well as giving the kids a fun and safe area to play. While this is a lovely looking playhouse, it is also made to last and this is one very robust playhouse. The walls are made with 16 mm thick cladding which thanks to the wood being pressure treated is very strong. The roof is well made and is a major feature of the playhouse thanks to the green shingles used to protect the roofing boards. So the playhouse can take the rough and tumble that kids like to do. Pressure treated floor boards have been used so that the floor is strong and solid. Delivery may take up to 12 weeks! The Maya Playhouse is a very smart looking child’s playhouse that really caught our eye. With its raised design, kids are going to love climbing up the little step and looking over their fence and feeling like they are on top of the world. The playhouse just has a lot of charm to it and we are sure parents and grandparents are going to enjoy watching the kids play on here as much as the kids themselves are going to enjoy playing on it. The picture really does not do justice to the size of this playhouse. Now this is not one of the largest playhouses on the market, but at 6 feet 11 inches deep and just over 5 feet wide, the kids will have plenty of space to play. But at the same time you do not have to worry about this dominating your garden. One thing we will say is that the 6 feet 11 inches of depth is including the decking area so inside the playhouse there is about 4 feet 11 inches of depth. Height wise, you are looking at over 4 foot of head room along the ridge and 3 feet 2 inches at the eaves. 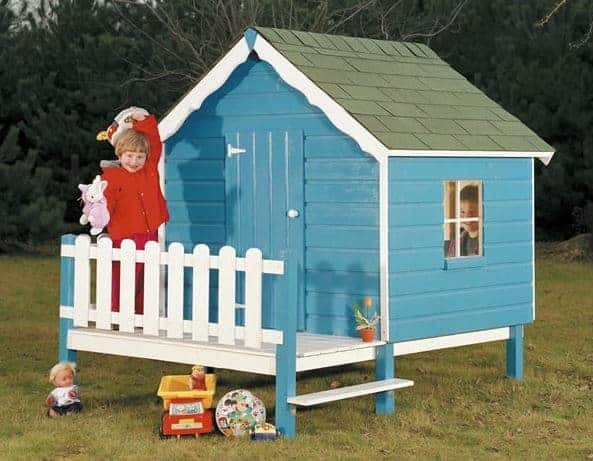 In all not only is this a lovely looking playhouse it is also a very ideal size as well. The roof is one of the highest quality sections of the Maya playhouse. We love how they have gone for an apex saddle design and feel that the way it will force water to run off at the sides and not onto the decking was a smart decision. On the inside they have used strong roof boards, but it is what covers these that catches your eye. Rather than go for just standard roofing felt, they have used these adorable, green coloured shingles that we just love as it gives the playhouse that little bit extra personality all the while ensuring the rain stays out. While the playhouse may have a very cutesy kind of design, this does not mean that it is weak. Quite the opposite actually as they have used pressure treated Northern pine wood for the cladding. This gives it a very attractive look, but as they are 16 mm thick and pressure treated. The playhouse is going to be able to take some punishment from the kids and from our great British weather as well. The Maya playhouse does not actually disclose what kind of framing they have used and while normally this would be something that would give us cause for concern. We do feel that the fact this is made with nice and thick Northern pine wood that this is going to be one very strong and solid structure. So while we would like to know exactly what kind of framing is in here, with the rest of the playhouse being so solid, we are sure you will not have any problems when it comes to its durability. The walls are not the only thing that is pressure treated as the floor is made from 16 mm thick pressure treated panels. The people who made this playhouse, clearly know how wild kids can be so it is great to see that they have put a solid set of floorboards in here. So no matter if they are wrestling or dancing to Frozen, this is one floor that is going to be able to take that kind of jumping around. The decking area is also very well made and it has a very attractive look to it which compliments the rest of the playhouse very well. The Maya playhouse is pressure treated which is great for two reasons. First of all it ensures the wood is well protected from rot, but also it means that once built the kids do not have to wait for you to treat it before they can go inside. So the kids will be happy and you will be ecstatic that you do not have a group of kids harassing you about if the paint is dry yet. Believe it or not there is no mention anywhere of what kind of warranty you get with this playhouse. We have looked high and low and it is not listed anywhere on the page for this playhouse so be sure to ask about it before you order. 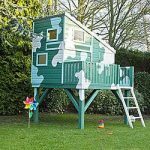 Although here at WhatShed we have never seen a playhouse, shed, summerhouse or other garden structure that is pressure treated come with anything shorter than a ten year warranty, but still be sure to ask exactly how long the warranty is. The door they have used is just as adorable as the rest of the playhouse. The door is made with vertical cladding and its strong door hinges look great as well. The door is a very good size at 3 feet 2 inches high and 1 foot 6 inches wide which is more than big enough for kids to drag a bunch of toys through. Now there is one strong glass window located on one side of the playhouse and this is one very high quality and good sized window. But we must say we feel that this playhouse could have really used a couple of other windows. One on the door and one of the back we feel would have really been good. So while we have no complaints over the size or quality of the window they used, we do feel that at this price range there should have been a couple more windows. Clearly you do not want the same kind of security with a kids playhouse that you do with a shed or summerhouse, but we feel that the Maya playhouse is just as secure as the majority of other playhouses that we have seen. There is no lock on the door, but honestly if there was then you would just have to keep locking and unlocking it all the time so it is for the best there is not a lock on the door. While we do wish that there were a couple extra windows on the playhouse, the fact that there is only one does mean that this is a very private playhouse and your kids do not have to worry about mum and dad peeking in on them when they are hosting a tea party with their little friends or toys. There are not any customisation options offered with this playhouse, but to be honest with you this is not something that bothers us. You can always put a little chair and table on the outside if you want to spruce that up. But when it comes to the inside, no matter how nice you make it look, the kids are just going to trash it in three minutes anyway. The roof, decking and cladding design is just ideal so we feel that no customisation options are needed anyway. 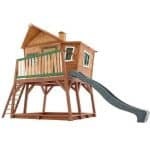 There is only one extra offered with the Maya playhouse and that is an installation service. To find out how much this costs though, you will have to give them a call. Apart from this though there are no other extras to worry about. At a glance it may not look it, but the Maya playhouse is one very high quality children’s playhouse that we honestly have no major complaints with. The pressure treated walls will keep rot at bay and the pressure treated floor will ensure it can take quite a bit of punishment. So we are sure that this will last as long as your kids can fit inside. This is not one of the larger playhouses that we have seen, but for younger kids this is going to seem huge. It is also not going to take over your whole garden which we are sure some of you will be very happy about. An installation service is on offer here. But if you want to save a little money or have just stocked up your tool box and are feeling brave, then we do not see you having any major problems installing this. With the help from a friend and not too many tea breaks, you should have this installed in a few hours. Look we really like this playhouse. 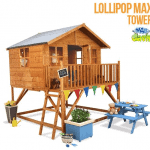 It is very well made, the decking area and the roof are an awesome touch, but the price is quite high for a playhouse of this size. Final Thoughts: The Maya playhouse is the kind of structure that grabs your attention the first moment you see it. That gorgeous roof, the adorable decking area and just the general style it has are very impressive. It is also very well made so it has a strong backbone to go along with those good looks. No matter how rough your kids play, we are sure that this playhouse can take it. The price is high, but you are paying that extra money for the high quality, pressure treated wood which is what makes this such a robust structure. 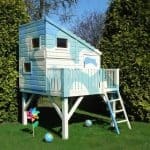 We have seen many similar sized playhouses for a lot cheaper, but if you want something that is made with the best materials then this is well worth considering.